In about 4 weeks we'll hopefully have a 93/94 tournament at Warcon in Varberg. I wrote this report after last year's tournament. The report was written in Swedish, as the blog's readers were pretty much only Swedes a year ago (that may also have something to do with the fact that the blog was in Swedish). 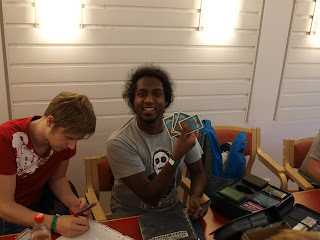 Today only about 1 in 20 readers are Swedes, so I post a crude translation of my old tournament. Arabian Nights had a lot of new and innovative design. It's easy to forget exactly just how many new things were introduced in this set; lands with other abilities than just tapping for coloured mana, spirit link abilitys (El-Hajjaj), cantrips (Jewled Bird), coin flipping (Bottle of Suleiman) and minus-counters (Unstable Mutation) were all introduced here, just to name a few. One thing that I found particularly sweet were the cycles of powerful creatures. Of course Alpha had introduced a cycle before this; the 'boons' that gave you three of something for one coloured mana (Ritual, Salve, Ancestral, etc). Arabian Night took it one step further with the introduction of Djinns and Efreets. 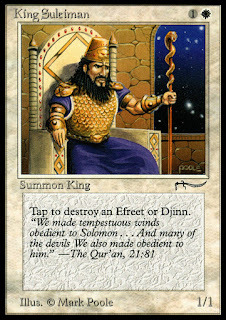 Four of the colours originally had one Djinn and one Efreet each, and these creatures proved to be some of the most powerful creatures printed for years to come. Cards like Juzam Djinn, Serendib Efreet and Ehrnam Djinn are reasons why City in a Bottle is powerful card. If the 93/94 format would have a hall of fame, Pefken would be an auto-include. Apart from winning n00bcon twice, he also looks one step beyond the meta, and finds non-traditional powerful decks that can beat the field. 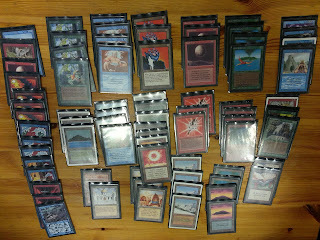 At n00bcon 2 he won with a zoo deck, and at n00bcon 4 he reinvented Parfait to take him to the top. Last n00bcon he lost in the top4 against Elof (the Varberg Juggernaut) with a creature heavy deck I henceforth will refer to as Moon Midrange. Moon Midrange relies on under-costed and powerful creatures combined with unfair spells. It has some relation to the Ehrnam Deck, but supports cards like Blood Moon and Detonate, as well as playing a double digit amount of creatures. It's been a hectic week and a half. I just started a new assignment in Oslo, and the weekend included both a birthday for a two-year old and a bachelor party in Gothenburg. It's quite a bit easier to travel to Gothenburg from Oslo than from Munich btw. 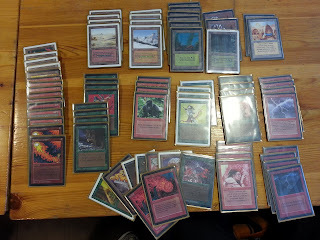 Speaking of Munich; Alex, one of the Bavarian heroes that I played 93/94 with in Regensburg, asked me about additional lists from n00bcon. On that same note, a Philadelphia (Philadelphian?) old school player named Brian had that same request today, so I figure that it's high time for some more lists. I'll post four sweet decks today, and try to update with four more before the end of the week. I apologize that some of the pictures may look a little blurry, it is possible that the photographer had a beer or two during the event.